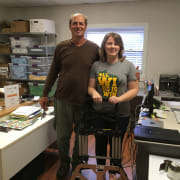 Supporter & staff in the office. Learn about the native plant movement and make a contribution to one of the simplest solutions for combating pollution, habitat loss and climate change: native plants for landscape and restoration. We are looking for committed volunteers who can help us improve our staff's capacity to execute programs and take on new projects. Role: Assist with a variety of office tasks including but not limited to data entry, mailings, packing boxes for shipment, online research and scanning documents. We have many needs and other duties may be assigned based on your interests, abilities and availability. Location: office located at 1900 S Harbor City Blvd, Ste 229, in downtown Melbourne. Time Commitment: Four hours/week, Monday - Friday, 9:00am-5:00pm, for a minimum of 8-10 weeks preferred. Scheduling flexible within standard office hours. Requirements: Basic knowledge of computer, data entry, Internet. Pleasant professional manner, dependable, able to work in small office. Passion for our natural world! Support: Instruction and training will be provided and staff will be on hand at all times to assist. Prefer minimum 4 hours/week, for a minimum of 8-10 weeks. Flexible within standard office hours. Basic knowledge of computer, data entry, Internet. Pleasant professional manner, dependable, able to work in a small office. Must be able to lift 20-lb. boxes.